Young The Giant in Montreal or Quebec City? Inform me about the next events for Young The Giant. 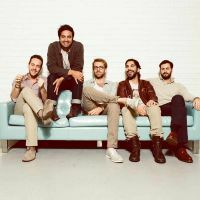 Enroll yourself to our priority waiting list for Young The Giant to be alerted when new tickets are available. Filling this form doesn't engage you to any purchase. Young the Giant will land at the Montreal Metropolis on September 20th, 2016, with their Home of the Strange Tour. Young the Giant is an American rock band that was formed in 2004. The group has 5 members in their team : Sameer Gadhia, Jacob Tilley, Eric Cannata, Payam Doostzadeh and Francois Comtois. Their last visit was in 2015 while they were doing a concert as part of the Osheaga Festival presented at the Parc Jean-Drapeau.